Are you looking for for an amazing, all-natural skin treatment? Several years ago I started reading the labels on my beauty products. Scary! The more I read about the potentially harmful ingredients in drug store lotions and potions, the more I was determined to find all-natural alternatives. My sweet hubby (I call him the mad scientist) got on the band wagon and together we started experimenting with all sorts of different recipes from shampoos to toothpaste. Some have been keepers, others not so much. This Fabulous Skin Salve was definitely a keeper! After all the products we’ve come up with, it’s still my favorite. 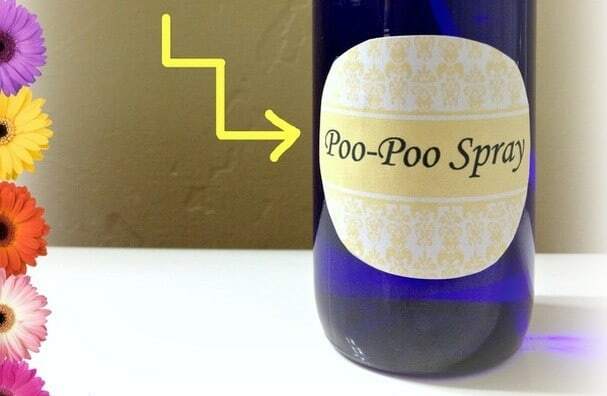 Lately (thanks to Pinterest) it seems there is a surging DIY beauty products craze going on. If you’re skeptical start with Fabulous Skin Salve. It will make you a DIY convert, I promise. Once you start making your own products these ingredients will become standards in your home. A small investment now will save you big bucks in the end. Coconut Oil—I love this stuff. Get it extra-virgin and unrefined. Coconut oil is a natural moisturizer that nourishes and protects your skin. It is also antibacterial. EVOO—Extra-virgin olive oil contains 4 anti-oxidants that help neutralize free-radicals that can lead to skin aging and skin cancer. It is hydrophillic meaning it traps moisture in your skin leaving it softer and smoother. Vitamin E—a powerful anti-oxidant that protects and repairs your skin while restoring elasticity. Lavender EO—soothes occasional skin irritations, helps skin recover quickly, calming and relaxing. Cederwood EO—promotes clear, healthy skin, relaxing, soothing aroma. Melaleuca EO–cleanses and rejuvenates the skin, promotes clear, healthy complexion, soothes minor skin irritations. Frankincense EO–promotes cellular health, rejuvenates skin, helps build and maintain healthy immune system, increases the potency of any oil it’s paired with. I only use therapeutic grade essential oils because they are of the highest purity you can buy. Your skin is the largest organ in your body and what you put on you, you put in you so whatever brand you use make sure it is pure enough to take internally. Put the coconut oil, EVOO and beeswax in a glass jar (I used a wide-mouth pint mason jar) and place jar in a pan about half full of water. Heat up water, stirring mixture frequently until everything completely melts. The beeswax will seem like it’s never going to and just when you’re about to give up, Bam!, it’s gone. Carefully lift the jar out of the pan (use oven mitts please, it’s hot!) and place it on a dish towel on your counter. Immediately add arrowroot powder, by slowly sprinkling it into the oil, stirring vigorously at the same time to prevent clumping. Now you need to let the mixture cool for a few minutes because essential oils lose their medicinal properties in high heat. My rule of thumb is if I can hold my fingers against the jar for ten seconds without screaming, it’s ready to add the EO’s. Not very scientific I know, but it works. Snip the ends of the vitamin E capsules and squeeze into oil mixture. Add the essential oils and mix thoroughly. As soon as you have added your oils you need to get the salve into containers. My favorite container is a 4 oz. mason jelly jar. 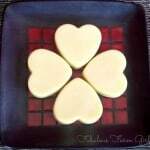 This recipe will fill 2 of those and they make really great gifts. You’re gonna thank me right around Christmas time! 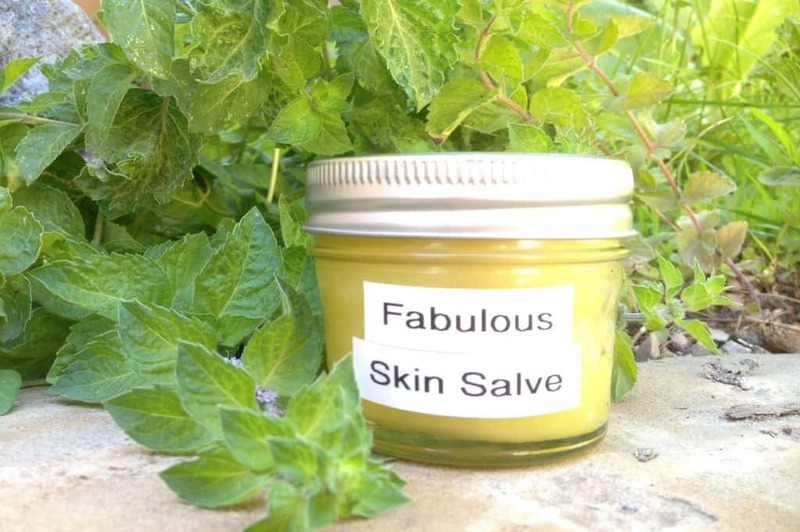 So now that you’ve made Fabulous Skin Salve you’re probably wondering what to do with it. Well for now just cover it with something (wax paper, printer paper, whatever) so weird stuff doesn’t fall in it and let it sit for a several hours until it totally sets. Put the lids on and, if you’re giving it away, attach a cute label and some ribbon. Put one for yourself on your bathroom counter and start being amazed by this simple, farm girl Fabulous Skin Salve. Just some of the uses–hand lotion, lip balm, cuticle cream, wrinkle cream, all-purpose moisturizer, irritated skin, cracked heels, dry elbows and knees, massage lotion, stretch marks. Combine first 3 ingredients in a glass jar and place in a pot half-filled with water. Bring water to a boil and stir frequently until ingredients are completely melted. 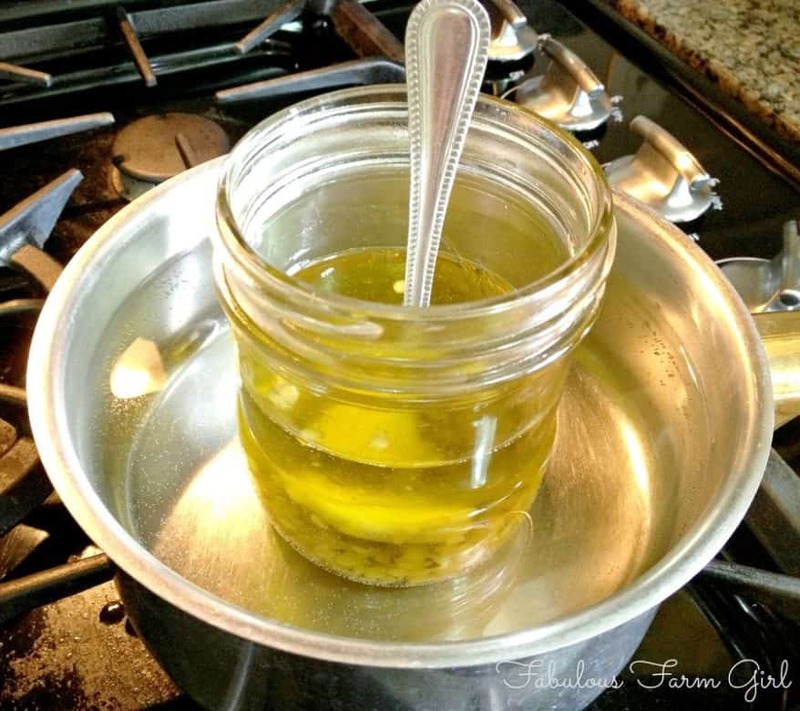 Remove jar from pan and place on a dish towel covered counter. Slowly add arrowroot powder, stirring constantly to avoid lumps. Allow mixture to cool enough that you can touch the jar comfortably for at least ten seconds. Snip the ends of the vitamin E capsules and squeeze into oil mixture. Add essential oils and mix well. Immediately pour into desired containers and cover with a piece of paper towel so nothing weird gets in there. Do not disturb for several hours and preferably overnight. Once completely cooled, put lids on and store at room temperature. Would you consider selling this, my grandson has bumpy, sensitive skin and would love to try this! We buy special soap, lotion, and sunscreen. I love these kinds of salves. I hope you will come link up at the first ever Oil me up Wednesday at My Lamp is Full. We start at 6 am on Wed morning. Thanks Janine and thanks for the invite. I’m always looking for link parties and your website is right up my alley. Count me in. You’re so welcome Nanette. 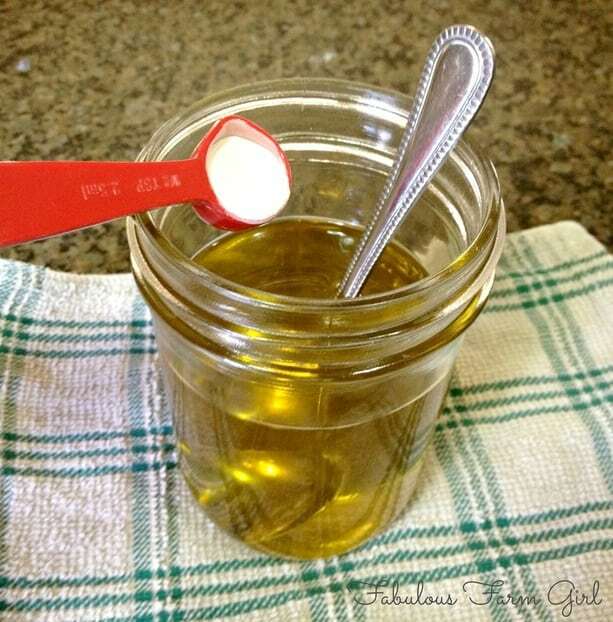 This really is my favorite homemade beauty product and I know you’re going to love it! Come back soon. LOVE this post! Thanks for sharing at Tuesdays with a Twist. YOU have been featured @ Back to the Basics this week! Wow Mary, I’m so flattered! It means even more since I think your blog is awesome with so many great ideas for improving my garden, Thanks a ton!! Leah, I was wondering about the differences in the oils for the miracle salve and the salve for excema? It looks like you have geranium and thyme in one and cedar wood in the other? Does it matter which recipe I follow or are the geranium and thyme really good for skin diseases? Thank you!!! Hi Abby–thanks for your question. The Miracle Skin Salve is a great all-purpose salve that you can use for any minor skin issues (including occasional eczema). 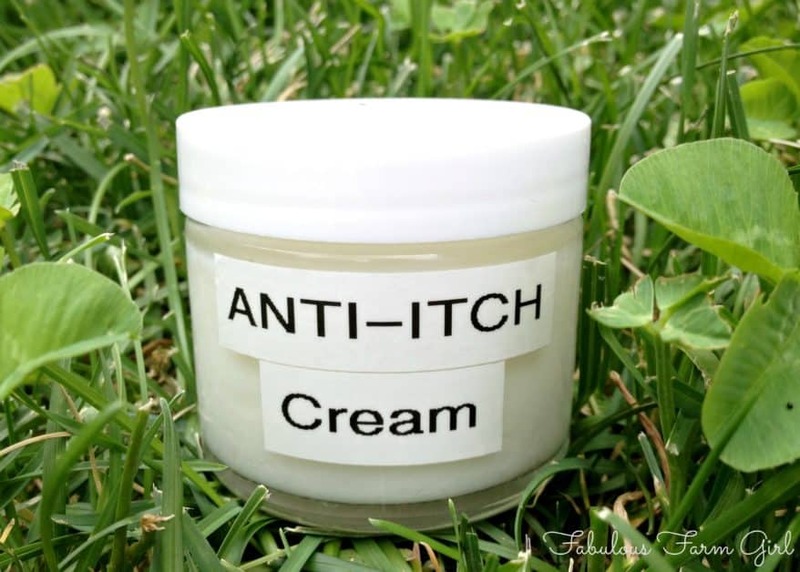 But for a lot of people who suffer from severe eczema or psoriasis they need something stronger. I formulated Miracle Eczema Skin Salve with thyme EO and geranium EO because they specifically target eczema. Geranium is also great for the dry skin specifically associated with eczema. I then added avocado oil because it is one of the carrier oils most recommended to combat eczema. The lavender, melaleuca and frankincense EOs are in both recipes because they are the best all-around skin oils. 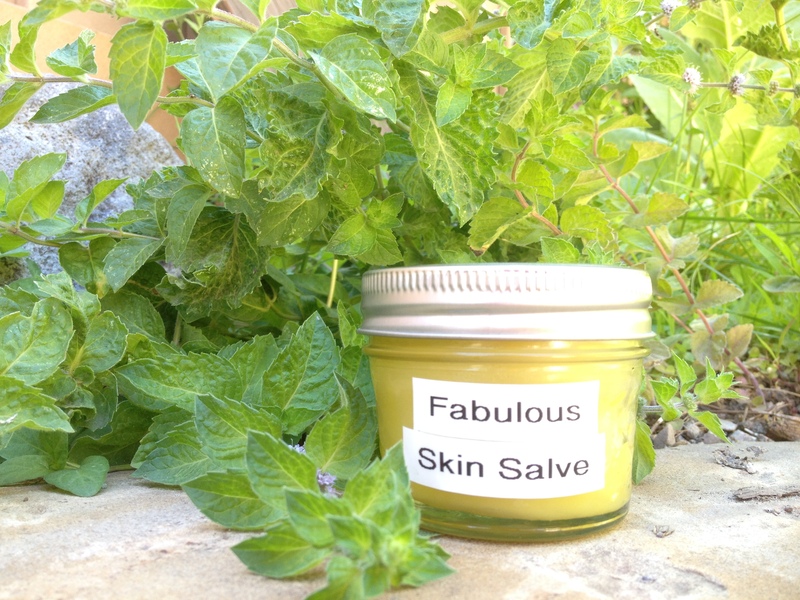 If you just want a great skin salve to solve lots of skin issues make this Miracle Skin Salve. If you want to specifically deal with eczema or psoriasis then make the Miracle Eczema Skin Salve. Hope that helps. You’re welcome Shashi! It’s so versatile and is still my favorite DIY beauty product. Have a fabulous week! Hi Kara–thanks for stopping by. It is the citrus oils that can break down plastic although it takes a long period of time if they are diluted. As a general rule though, I do only use glass containers when making essential oil products and recommend you do the same. When I first started teaching classes many years ago I would give out samples in small plastic containers like the ones in the picture, knowing my students would use them up quickly. I have since found a source for small glass jars and use them instead. Have a great week! Thanks Renia! You’re gonna love it! Have a great week. 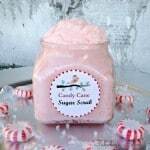 I just made the salve and love it. The Arrowroot works good to decrease the greasiness. That makes me so happy, Nancy! 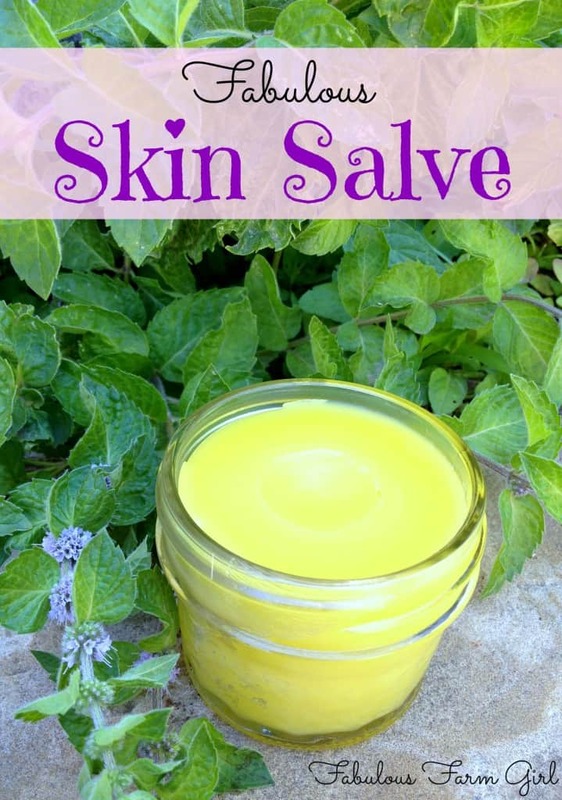 This salve is so awesome for your skin so use it lots and enjoy! That is so exciting Deanna! Sounds like maybe you figured out what to give people for Christmas this year. LOL! 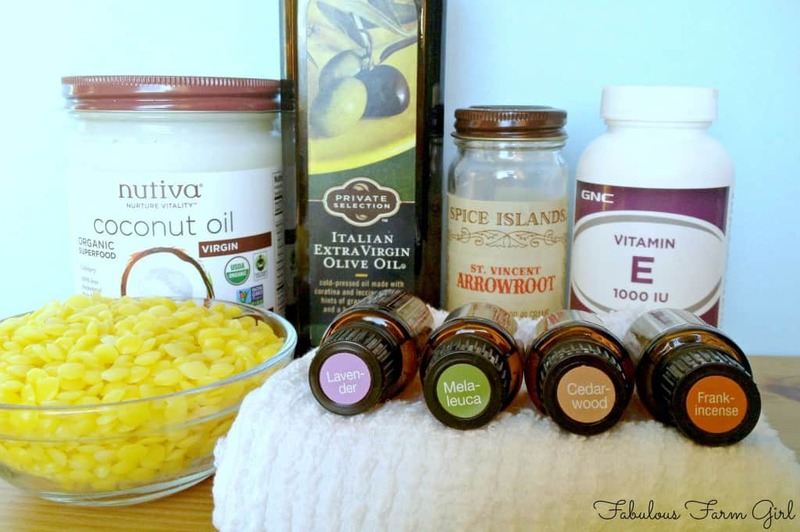 I would love to know what other oil combinations your willing to share your secret recipes. Keep up the good work and have a fabulous week! My health food stores are out of the beeswax pellets. They have 1oz bars can that be used? Also can cornstarch be substituted for the arrowroot? Hi Jessica–thanks for your questions. Beeswax bars are fine, you just need to grate in on a cheese grater so you can measure it out. And cornstarch is fine to use instead of arrowroot powder. So glad you’re going to make this awesome salve. Have a great day! I just made this and your Miracle Vapor Rub. I’m so excited to use these two salves, but I have a question. I made half-batches of each expecting to get one 4oz jelly jar of each, but I ended up with almost two, full 4oz jars of each. I used half of each ingredient. Did I do something wrong? Hi Valerie! So glad you tried tried these recipes but I must say you’ve got me stumped. Did you add 1/4 c. of coconut oil and 1/4 cup of EVOO for a half recipe? A four oz. jelly jar fits slightly less than 1/2 cup so either you forgot to half those two ingredients or your jar is only 2 oz. If you forgot to half the two main ingredients all is not lost. Contact me through the contact form and I will walk you through how to fix it. If you really have 2 oz. containers then you’re good to go. hope that helps. Thanks for such a quick response, Leah! Upon looking at your photo another time, I may have discovered my blunder. I wasn’t aware that a 4oz jar wouldn’t hold the entire halved recipe (I did, indeed, halve all ingredients) and when I poured the Miracle Chest Rub salve into the jar and found a bit left in my measuring cup, I didn’t want to lose any of the sure-to-be goodness and used a second jar, spooning some for the first into it, too. So, when it came time to jar the Miracle Skin Salve, I stopped pouring when I reach the threads for the lid and used a second jar, again. My jars are not filled to the tippy top like yours! Problem soved, I think. Thanks, again. do you have any recommendations for alternatives to the coconut oil? I have a daughter with very sensitive skin, but she is allergic to coconut. Hi Lorene–thanks for your question. You have 2 choices if you don’t want to use coconut oil. The first choice is to replace it with the same amount of EVOO or another liquid oil such as sweet almond avocado or jojoba oil. The other option is to replace the coconut oil with babussa oil which comes from the babussa palm that grows in Brazil. It is a non-drying oil that has similar properties to coconut oil and can be used in the same context. Babassu oil boasts super moisturizing properties that heal dry skin and improve skin’s elasticity. I found several sources of it online or you might also check your local health food store. It is comparable in price to coconut oil. The first option will be easier but the second option will give a slightly better salve consistency. Hope that helps. Hello! Just wandering, after it is prepared, how long does it last? Shelf life. Hi Natalia-thanks for your question. From a shelf life standpoint, olive oil will last 2-3 years and so will coconut oil. Most essential oils, including the ones in this recipe, will last indefinitely as long as they are kept out of high heat. Hope that helps. You mention “fabulous skin salve” for which I find your recipe and you also mention “ezcema skin salve” for which I can’t locate your recipe. Your blog search bring up on the recipe for the “fabulous skin salve” but it seem to me from your comments that these are 2 separate recipes. 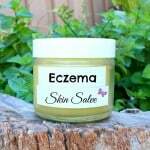 Can you please send me the “ezcema skin salve” recipe please. Mahalo! Hi! This recipe looks amazing, and I am so excited to try it! Quick question, though, I am allergic to Lavender Oil. Am I able to substitute it for something else or does the Lavender oil need to be in it? 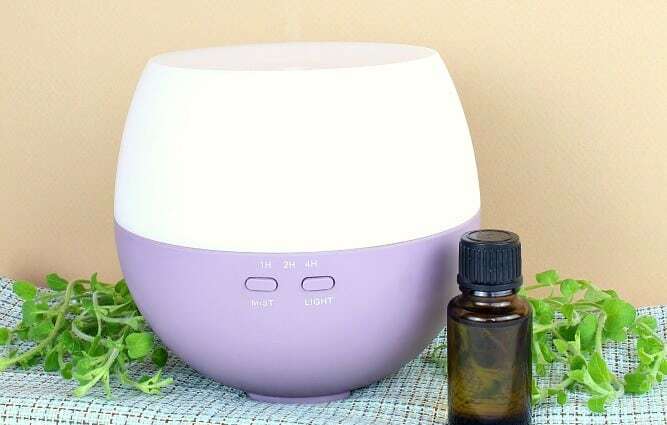 You could make it without the lavender but just increase the number of drops of the other oils so the total amount of essential oil in the recipe is the same. If you want to replace the lavender I would use geranium. If you don’t have that you could use myrrh or sandalwood which are also great skin oils. Hope that helps! Why do you use the arrowroot powder? Is this formulation safe for children under the age of 7 months? This is my second time making it and I love it. I’ve shared my finished fabulous skin salve with my sisters as they are all older than me and felt we need something to keep our skins looking young and soft. Thank you. Hi. I made this salve for my mom’s really dry hands but it’s a hard. Can this salve be made creamer? I just made this ( well… Similar ), and made use of the spoon that I was stirring with. Let me just say that I live in the high desert and snow just arrived. Double whammy for dry skin! I can’t wait for this to cool so that I can shower and put it on from head to toe. This concoction is so silky!! What can you use in place of beeswax? To make a vegan version? Are every essential oils listed required? Could I drop a few and maybe substitute tea tree oil?